The news of the sudden, tragic deaths of Marie and Jerry Hugel of GTEV Schlierachtaler Stamm has traveled quickly through the German community. They have been an integral part of the Gauverband since its founding, and it is hard to think of our organization without them. Marie and Jerry loved their Bavarian heritage and were regular visitors to the clubs on the east coast, at every Gaufest, and at major events all over the country and in Bavaria. Their enthusiastic attendance at the München Oktoberfest last year, riding in the horse drawn coach, will stay in our memories. Jerry and Marie made friends wherever they went, and we join their family in mourning their passing. The Gauverband and its members extend our deepest condolences. May they rest in peace. 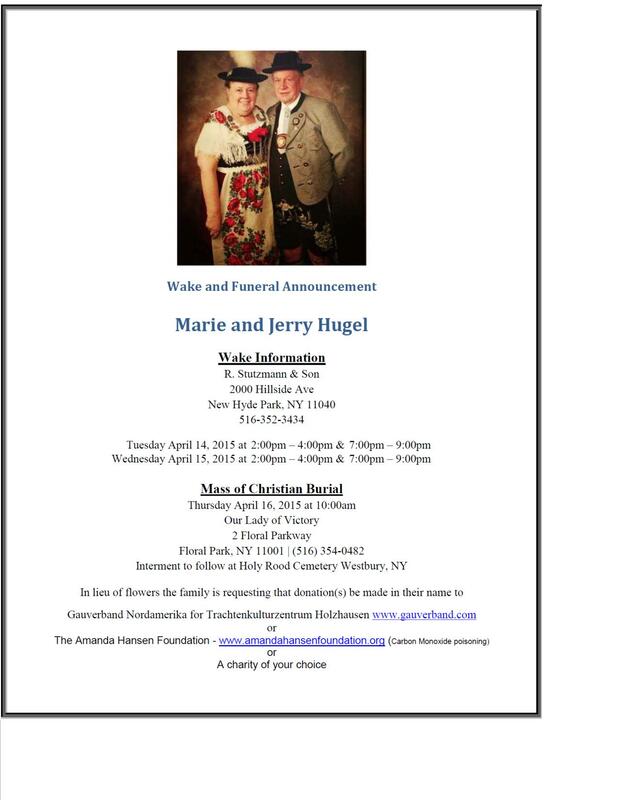 Below is the information the family shared about the wake and funeral for Jerry and Marie, as well as suggestions by the family of charities in lieu of flowers. Marie and Jerry visited Holzhausen several times since it opened and were enthusiastic supporters of it. For those who wish to honor their memory with a donation, please send a check made out to "Gauverband Nordamerika" to the Gaukassier (John Blank, 590 Centerville Rd #332, Lancaster, PA 17601). The Gauverband will collect these donations and forward them to the Trachtenkulturzentrum in the Hugels' name.